I hope each of you is enjoying a wonderful summer, as you receive this message and this newsletter. I have the privilege of serving as your Governor for our Massachusetts ACP Chapter, and for my inaugural message I want to express my gratitude to each of you, for what you do for your patients. I am committed to supporting our state chapter and national ACP's efforts to bring back the focus of medicine to the essential physician-patient relationship. Our profession is a noble one, and though there are many changes and challenges ahead in healthcare, what we do, by healing and helping patients, is a special “art” that should be preserved. I am honored to be the first female Governor in the history of our MA ACP Chapter, and the first woman physician of color to serve in this role. The fact that I am breaking the proverbial “glass ceiling” (and “bamboo ceiling”, too), reinforces my commitment, as Governor, to support diversity and inclusivity in our Chapter's outreach and efforts, mirroring the national ACP initiatives and endeavors. Our MA ACP Chapter is very active and thriving, and rather than redundantly summarizing all the wonderful work we have been doing on behalf of our patients and our ACP members, I will let the rest of the newsletter content speak for itself. I do encourage each and every one of you to become involved actively with our MA ACP Chapter, as your “professional home”. Consider ACP as the “big tent” for all internists, under which you can find colleagues with whom you can share and collaborate, regardless of your practice environment or subspecialty focus. Our MA ACP Chapter's recent Governor's Council Strategic Planning retreat revealed the importance of relationships with each other as medical professional colleagues, as the basis for how we each became involved with and stay connected to ACP. In that same spirit, I invite you to reach out to me, or other MA ACP Chapter members, to forge connections that will hopefully become professionally and personally rejuvenating. Do consider recruiting colleagues who are not ACP members to “join our tent”. I look forward to hearing from you and staying connected with you, throughout my term as Governor, and beyond. Thank you, again, for everything you do for your patients and for our profession! The year-end financial statement shows that the chapter is financially healthy, ending the fiscal year with a surplus of $5,425.21. All income items came in over budget. Total income was $116,201.81 against a budget of $114,950. Income is mostly related to membership dues. Total Expenses amounted to $110,777.60 against a budget of $102, 350. Excessive expenses compared to budget were related mostly to Chapter Meetings. A detailed statement is available by contacting our Chapter Administrator, Lynda Layer at llayer@mms.org or 781-434-7317. 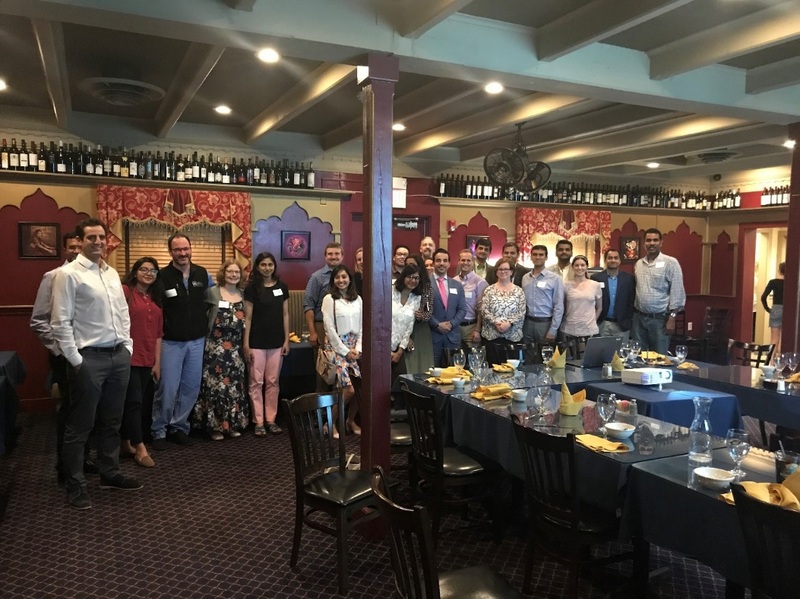 Our Early Career Physicians (ECP) continue to be active with hosting meetings, under the stewardship of our Co-Chairs, Drs. Ebrahim Barkoudah and Nii Tetteh. The ECP hosted a program in West Springfield, MA entitled ACP Rises in the West: Career Guidance for Early Career Physicians in May. We were pleased to provide this opportunity to our members in the western part of the state and we look forward to more programming in the future. In addition, the ECP Council is working with Dr. Kerry Palamara on a panel discussion on physician wellness in conjunction with Dr. Palamara's presentation, “Enough About Burnout! Let's Change the Conversation to Well-being and Thriving,” at the MA ACP Annual Scientific Meeting on November 17, 2018. Additional details on the complete program can be found later in the newsletter. Please contact Chapter Administrator, Lynda Layer (781-434-7317) if you are interested in getting involved with any of the initiatives list above. It has been active year for the Health and Public Policy Committee. Our mission is to advocate for policy that improves the quality and effectiveness of health care in the Commonwealth of Massachusetts and that promotes the practice of medicine. Our committee has 25-30 members that meet at least quarterly to discuss policy issues and advocate for them through various efforts including speaking with legislators and providing education to chapter members, policy makers, and the general public. 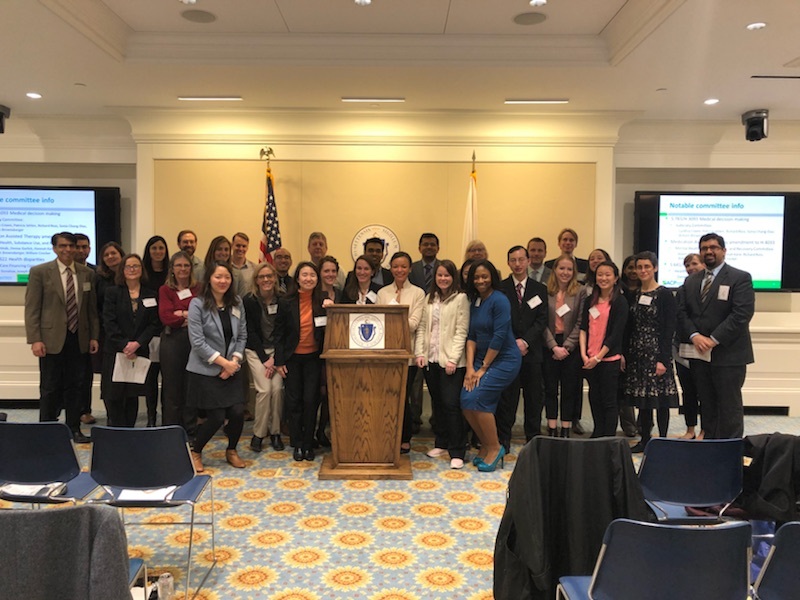 In the past year, we organized the annual Advocacy Day at the State House, advocated for and testified on legislation for increased prescription drug cost transparency, and provided education about Buprenorphine prescribing to our members. We welcome your involvement in our committee as well as your feedback about health and public policy issues of importance to you. Please contact our Chapter Administrator, Lynda Layer at or 781-4341-7317 with any issues you would like addressed or if you would like to join the Health and Public Policy Committee (HPPC). Click HERE to join the Advocates for Internal Medicine Network for state and federal advocacy initiatives. 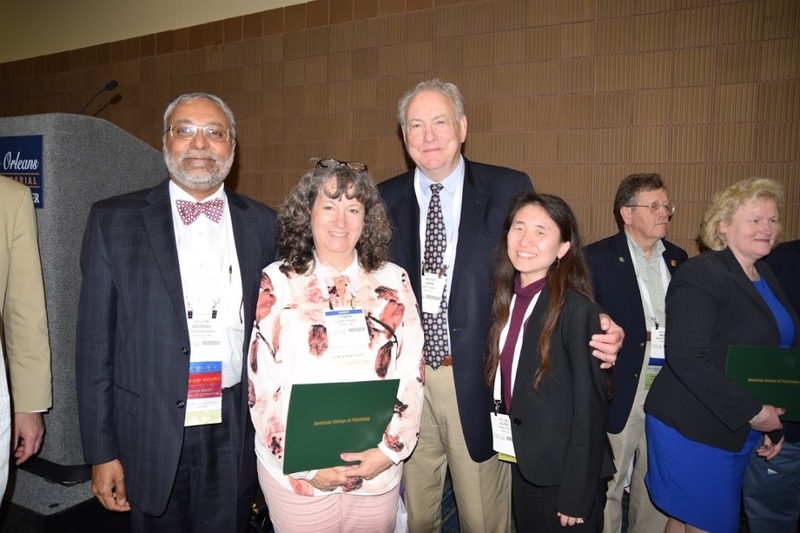 MA ACP HPPC Co-Chair Zoe Tseng, MD, FACP received special recognition from the ACP for her work as an advocate for internal medicine. 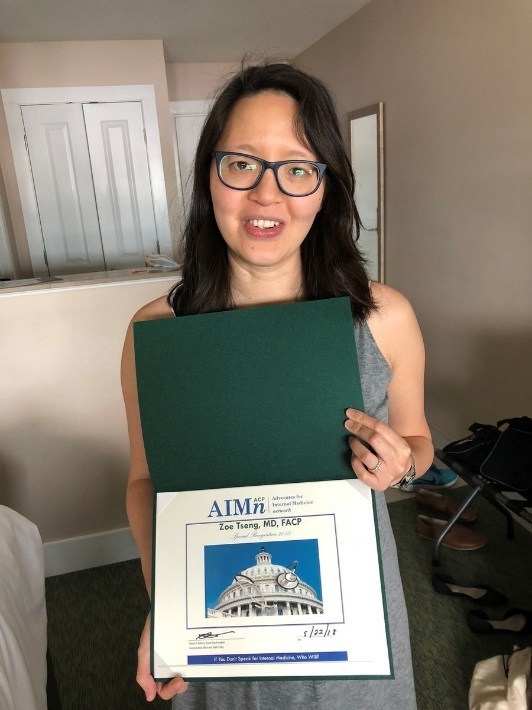 MA ACP Wins John Tooker Evergreen Award at 2018 ACP Internal Medicine Meeting for Advocacy Day at the Statehouse. The third annual Advocacy Day at the Massachusetts State House took place on April 4, 2018. It was organized by the Chapter's Health & Public Policy Committee. The day started with an update on the state of healthcare in Massachusetts by Brendan Abel, who works in Legislative and Regulatory Affairs for the Mass Medical Society. This was followed by briefings on three issues and their related legislation: 1) the ability to appoint a surrogate decision maker for an incapacitated, hospitalized patient, 2) access to medication assisted treatment for opioid use disorder while incarcerated, 3) establishing a permanent Office of Health Equity in the Executive Office of Health and Human Services focused on reducing racial and ethnic health disparities in MA. Finally, Alex Calcagno, the director of Federal and Community Relations at Mass Medical Society, prepared the group for talking to their legislators and mock visits allowed participants to increase their comfort with this skill. Later that afternoon, the 36 participants visited the offices of 26 state representatives to discuss their concerns. Our hope is these visits are the start of building relationships with state legislators to further ACP's advocacy at the state level. We welcome your participation next year! As a budding internist, I've always been enamored with the concept of “advocacy” though I never quite understood what forms it could take. With a sense of moral obligation, having graduated with an MPH in 2012, I decided to seek out an opportunity to get involved. At the start of my internship, I learned about the MA ACP Health & Public Policy Committee and knew this would be a fantastic way to get started in political advocacy. As part of this committee, I worked with other physicians, residents, and medical students from Massachusetts to organize the 2018 ACP Advocacy Day. On April 4th, ACP members converged on the Massachusetts State House; half of the participants were first-timers like myself. To prepare us for our meetings, special speakers described the salient points of each bill we would be advocating for. Brendan Abel, a lawyer who works with the Massachusetts Medical Society (MMS), provided a perspective on the political environment surrounding the bills. We were coached by the enigmatic MMS Director of Federal and Community Relations, Alex Calcagno, on how to speak to politicians about medical issues. By the end of the morning, I felt my comfort and excitement rising. At long last, I met with the legislative team of my Representative and Senator in two productive meetings. After nearly one year of planning and organization, Advocacy Day represented the culmination of not only hard work but also the fulfillment of my own personal goal to become an advocate for my patient population. I have gained not only experience but familiarity with a process that was previously so intimidating. I look forward to engaging in more advocacy opportunities in the future! 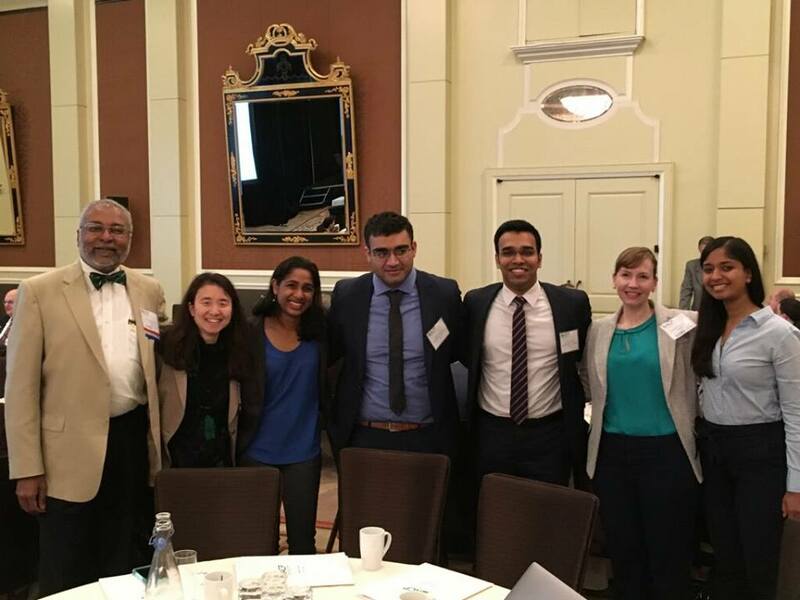 This year for my first time as an early MS4, I had the opportunity to join the American College of Physicians' annual Leadership Day on May 22 and 23 in Washington DC. Led by Massachusetts Governor Dr. Elisa Choi, many members of the broader ACP National Leadership, and countless Strategy & Quality Measurement leaders from health-focused government agencies, we embarked on two days of learning and advocacy, to help us better understand the current healthcare regulatory landscape and to hone in on important patient-centered reform needs. As early as the first day's first session, I could see how impassioned every attendee at Leadership Days was about improving the quality and practice of medicine. Whether it was fellow medical students, residents, or long-time practicing general internists, it was inspiring to be surrounded by a group of people who are enthusiastically driven by improving care for both patients and fellow colleagues. The resonance of my fellow attendees' missions became all the clearer when we began talking about the ACP's main policy priorities for the year and the challenges we faced in our own practices. These policy priorities include: promoting continued efforts towards tackling the opioid epidemic, stabilizing the insurance market, reducing drug prices, reducing unnecessary tasks on physicians and patients, funding for primary care training & graduate medical education, and reducing firearms deaths. We all were equipped with the facts and studies that revealed the importance of these policy priorities, but what made our advocacy workshops so empowering were the stories that we shared among group-mates and at the microphone about our own sobering and impactful patient experiences. The commonalities in patient experiences across very different practice settings showed how collective, unified action and speaking as a group can help elucidate and amplify change efforts at a grander scale. Motivated by these initial workshops, we spent the second of the Leadership Days traversing the serpentine, marble laden hallways of Congress's House and Senate. We met with the legislative aides for our Massachusetts Senators and Representatives, sharing our perspectives and patient anecdotes, to make pressing problems personal. Additionally, using what we learned and prepared during the day prior, we made concrete asks of our Representatives, identifying specific bills we would like supported and congratulating those whose efforts were already moving the needle forward on our policy interests. Our Congressional staffers were all receptive and interested in our ideas for making changes to patient experiences, and we were eager to continue our relationships and the dialogue after we headed back home up North. Now, reflecting on Leadership Days, it was an incredible experience for a budding physician like me. Coming to medical school, I wanted to make a different in patients' health, and have found it to be an incredible privilege to work in direct patient care, learning from people whose challenges and walks of life vary so much, but whose health issues have the potential to be improved with diligent, thoughtful, humanistic care. What I have also realized over time, and especially through Leadership Days, is that that care must not stop after a doctor's visit is over. Much care needs to hone in on how we can lead for change in our communities and at a national scale, to make the healthcare system and other social structures better and able to address critical patient needs overall. Our discussions of licensing hurdles to treat opioid use disorder, of predatory drug pricing, of the need for more primary care training programs, of the number of deaths from gun violence this year, and more showed how persistence and commitment to advocating for our patients can make incremental, and even landslide, changes possible, merely from having our voices heard. Taking action like we did to advocate for policy changes also confirmed how even amidst an uncertain political climate, we can find areas of alignment, because better patient outcomes is something we all can absolutely agree on. I hope this is the first of many Leadership Days to come for me, and that other medical students will join in as they embark on training, too! The ACP Advocacy Blog is written by Bob Doherty and maintained by the American College of Physicians. Refer to the blog articles for the latest in issues important to Internists. About the Author: Bob Doherty is Senior Vice President, American College of Physicians Government Affairs and Public Policy; Author of the ACP Advocate Blog. Bob will be our Keynote Speaker at this year's MA ACP Chapter Scientific Meeting on Saturday, November 4, 2017. Join more than 15,000 colleagues in the Advocates for Internal Medicine Network (AIMn) in advocating for the interests of internal medicine in Washington, D.C. The AIMn program is for ACP members interested in participating in federal advocacy. It is designed to help members engage with their federal lawmakers on policy issues important to ACP and internal medicine. ACP is an affiliate member organization of the American Medical Women's Association (AMWA). As such, all ACP members can join AMWA as an affiliate member for free. We encourage you to take advantage of this valuable ACP member benefit. Join here. This year we are honored to welcome Dr. Ana Marie Lopez, President, American College of Physicians and Shari Erickson, ACP Vice President, Governmental Affairs & Medical Practice. In addition, we will have panel discussion on PCP versus Hospitalist, a Unifying Perspective? And a session, “Enough About Burnout! Let's Change the Conversation to Well-being and Thriving,” with Dr. Kerry Palamara, followed by a panel discussion hosted by the ECP Council. In addition, we will be bringing back the Story Slam during the Governor's Reception in honor of the ACP President. Lunchtime will feature our Mentoring Collaborative, an ACP Update as well as the business meeting and awards presentations. Again, this year, we will start the day with our annual Poster Competition and Doctor's Dilemma. Come early for breakfast and support our students and residents. Registration information will be available on the MA ACP website in August. ACP Resident/Fellow and Medical Student Members are invited to submit abstracts to the 2018 Abstract/Poster Competition in advance of MA ACP Poster Day, Saturday, October 20, 2018 Massachusetts Medical Society, Waltham, MA. If you have worked on a research project or have an interesting clinical case, submit your abstract for a chance to present it at the Massachusetts Chapter Poster Day. The deadline to submit your abstract is 11:59 pm on Thursday, August 16, 2018. Click HERE for more information on the competition and how to submit your abstract. E-mail Debbie Brennan with any questions. For many who are members of ACP, you may be eligible to progress to Fellowship in the college. If you have never considered the same, please check out the ACP website at (). I strongly urge you to consider becoming a Fellow. I am happy to help with any questions that may arise if you do not find the information on the ACP website. 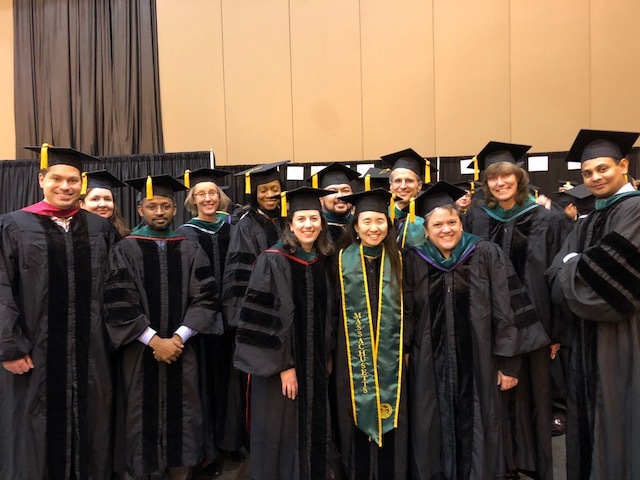 Achieving the FACP credential is a significant milestone for post-training physicians – one that shows leadership and commitment to excellence in the practice of medicine. ACP has developed a three-year Guided Fellowship Program which provides a framework toward meeting professional development goals, along with guidance and mentorship, in order to obtain the FACP credential. The program is open only to ACP Resident/Fellow Members that transition to full Membership each July. Click HERE for more information.